Shares of AK Steel Holdings, U.S. Steel, and Cliffs Natural Resources didn't respond as you might have thought after more anti-dumping tariffs were imposed on imported steel. 2016 has so far been a pretty good month for steel and iron ore stocks in the U.S., but last month was a bit of an exception as shares of AK Steel Holdings (NYSE:AKS), U.S. Steel (NYSE:X), Cliffs Natural Resources (NYSE:CLF) all declined more than 27% in August. What is even more surprising about this decline is that it came on the heels of another favorable court ruling for domestic steel producers. 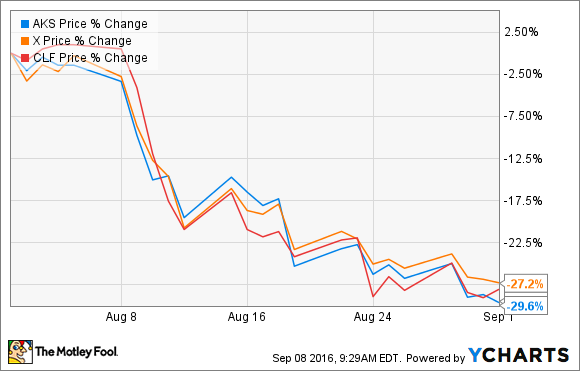 The biggest culprit for last month's decline came on Aug. 8. This was the first trading day after the U.S. Department of Commerce imposed anti-dumping tariffs on another half-dozen countries for what it viewed as subsidizing local steel production and selling it below cost in the U.S. market. This isn't the first time the Commerce Department has made such a ruling, and that is what is so strange. Late last May, similar anti-dumping tariffs were imposed on corrosion-resistant steel from a handful of countries that were as high as 210% for some Chinese imports and would range from 3.4% to 48% depending on the country of origin. That ruling sent shares of steel stocks flying. To be fair, this recent ruling was on steel from Brazil, Turkey, South Korea, Japan, Australia, and the United Kingdom. One name that is missing from this list, though, is China, by far the world's largest steel producer. Since China's exports were already hit with anti-dumping tariffs in May, it would seem that this recent ruling doesn't carry the weight that the original one did. It's also possible that the market was looking for higher percentage tariffs than what the Commerce Department imposed. Some of the tariffs in this round were actually lower than the ones originally proposed, so there may have been a little bit of disappointment in these results. Overall, though, these should have been a net positive for AK Steel, U.S. Steel, Cliffs, and the rest of the U.S. steel industry, but that didn't seem to be the case this time. Also, it should be noted that these three companies weren't the only ones that saw declines from this hearing, but they were the ones that declined more than 10% in the month. These companies are much more sensitive to any potential impact on the price of steel because they need it way more than companies like Nucor and Steel Dynamics that have been much more profitable as of late. AK Steel and U.S. Steel have been struggling mightily to turn a profit for years, and investors are much quicker to pounce on good or bad news on these stocks because they are clearly more speculative investments in this industry than the ones that have maintained profitability. Iron ore producer Cliffs is in a similar situation. Cliffs' largest customers are AK Steel, U.S. Steel, and international steel giant ArcelorMittal because they use iron ore pellets in blast furnaces, whereas much of Nucor and Steel Dynamics use scrap steel and direct reduced iron in most of their facilities. Cliffs' dependence on these certain players, and its own struggles with profitability and balance sheet bloat, has made it a pretty volatile stock recently. It seems a bit strange that steel producers saw large declines in August after the Commerce Department ruled in their favor. Based on this ruling and past anti-dumping rulings, the U.S. steel industry is looking much better than it has in years. Ultimately, though, the real medicine for the steel industry will be a shutdown of some global production capacity to come in line with demand, but that could take some time. In the meantime, investors should have some hope that things will get better for AK Steel, U.S. Steel, and Cliffs Natural Resources. Now, it's on the management teams at these respective companies to find ways to further cut costs, repair damage to their balance sheets, and get back to generating returns for investors. After this price drop, it's at least worth keeping an eye on these stocks to see if they can deliver.